THE STATE WILL MAKE NO ATTEMPT TO CONTACT VENDORS WITH UPDATED INFORMATION. IT IS THE RESPONSIBILITY OF EACH VENDOR TO PERIODICALLY CHECK http://www.vermontbusinessregistry.com/BidSearch.aspx?type=5 FOR ANY AND ALL NOTIFICATIONS, RELEASES AND AMENDMENTS ASSOCIATED WITH THE RFP. STATE OF VERMONT Department of Public Safety RFP – DPS1161 PAGE 1 1. OVERVIEW: 1.1. SCOPE AND BACKGROUND: The Department of Public Safety is seeking to establish purchasing agreements with one or more companies that can provide Needs assessment of the Vermont Department of Health DUI program. CONTRACT PERIOD: Contracts arising from this request for proposal will be for a period of 3 months with an option to renew for 1 additional 3-month periods. Proposed start date will be August 15, 2011. SINGLE POINT OF CONTACT: All communications concerning this Request For Proposal (RFP) are to be addressed in writing to the attention of: Eric Buel, Department of Public Safety, 103 South Main Street, Waterbury, VT 05671-2101 Eric Buel, is the sole contact for this proposal. Actual contact with any other party or attempts by bidders to contact any other party could result in the rejection of their proposal.
. Every effort will be made to have these available as soon after the question period ends, contingent on the number and complexity of the questions. INSTRUCTIONS FOR BIDDERS: see sections 5 and 6. A brief review of the existing DOH program is detailed below: The existing DOH program consists of a number of discrete divisions all working towards identification of the blood alcohol content (BAC) from an individual. One division is concerned with Breath alcohol testing. Currently the DOH uses DataMaster instruments which are located throughout the state to determine BAC. These instruments must be purchased, placed into appropriate locations, calibrated and be properly maintained by DOH staff. Standard operating procedures must be detailed for processes involving the DataMaster and training provided to law enforcement officers certified to operate the instruments. Supplies and reference solutions are provided to the field. Some reference solutions are prepared and evaluated in-house. Documentation is maintained concerning the instrument- from purchase, calibration through routine operation. The next division is blood alcohol testing. The program performs blood alcohol testing as needed and provides BAC kits to law enforcement agencies and participating hospitals and clinics. Samples are stored for at least a year and analyzed if required by headspace analysis. The next division within the DOH Alcohol program concerns testimony and consultation. This covers testimony in court or consultation concerning breath and blood alcohol testing technology and physiology. The DOH staff provides training to law enforcement, prosecutors and defense concerning any aspect of the program. The staff must prepare affidavits and discovery packets. In addition, there are many clerical considerations to include documentation and tracking subpoenas, discovery requests, distribution of information relevant to the program to State’s Attorneys and others involved in the program. Files must be maintained and updated including instrument maintenance, performance and case files to include both breath and blood testing. PRICING: Any and all costs that you wish the state to consider must be submitted for consideration. If applicable, all equipment pricing is to include F.O.B. delivery to the ordering facility. No request for extra delivery cost will be honored. All equipment shall be delivered assembled, serviced, oiled, and ready for immediate use, unless otherwise requested by the purchasing agency. (a) (1) Bidder is required to self report detailed information including information relating to past violations, convictions, suspensions, and any other information related to past performance and likely compliance with proper coding and classification of employees requested by the applicable agency. The bidder is required to report information on any violations that occurred in the previous 12 months. (a) (2) Bidder is required to provide a list of subcontractors on the job along with lists of subcontractor’s subcontractors and by whom those subcontractors are insured for workers’ compensation purposes. Include additional pages if necessary. This is not a requirement for subcontractor’s providing supplies only and no labor to the overall contract or project. AVAILABILITY: Final report must be received by November 15 . Final payment will be provided upon receipt of a report that addresses the three points discussed in number 2 above. METHOD OF ORDERING: Purchase orders must be used to order items available under this contract. If verbal orders are given a confirming purchase order must be issued. INVOICING: All invoices are to be rendered by the Contractor on the vendor's standard billhead and forwarded directly to the institution or agency ordering materials or services and shall specify the address to which payments will be sent. METHOD OF AWARD: Awards will be made in the best interest of the State. The State may award one or more contracts and reserves the right to make additional awards to other compliant bidders at any time during the first year of the contract if such award is deemed to be in the best interest of the State. All other considerations being equal, preference will be given to resident bidders of the state and/or to products raised or manufactured in the state. STATE OF VERMONT Department of Public Safety RFP – DPS1161 PAGE 4 3.7.1 Evaluation Criteria: Proposal Format In order to simplify the review process and to obtain the maximum degree of comparability, proposals should be organized in a manner specified in the RFP. The following outline specifies proposal organization. The bidder must include in the proposal the following information. 1. A brief description of the firm including its history, organization structure and size. 2. An illustrative list of contracts for services performed by the firm within the past two years of a similar scope. It is recognized that this maybe a unique project but similar projects that involve an assessment of a program with accreditation in mind will be considered as similar in scope. A short narrative describing the nature and extent of each engagement should be provided. Please indicate those organizations which may be contacted by the Department of Public Safety as references. 3. A statement and discussion of the bidders analysis of the RFP requirements to include: A. A propose scope of work with an explanation of technical approaches and detail outline of the proposed program for executing the objectives of the RFP. B. Description of the number of direct hours of activity by each principal who will work on the project, broken out by major activity. C. Statements and discussion of anticipated major difficulties or problem areas with recommended approaches for there solution. 4. A description of rationale for the proposal to include: A. An explanation as to benefits of the intended approach. B. An explanation of why the number of direct hours proposed will be sufficient to the task. C. A statement of the extent to which the proposed approach and program can be expected to meet or exceed requirements and specifications of the scope of work. 5. A work plan including the appropriate starting and ending dates of the specific activities and the issuance of a final report. 6. Contractor reimbursement practice either on a time material basis or on a fix price bases. If time and material compensation is desired the cost proposal should indicate the estimated maximum total cost with a breakout of: A. Fees for staff time, showing the level of staff to be assigned, titles, hourly rates and estimate number of hours. B. Travel expenses, including transportation cost, lodging and subsistence. C. Detailed analyses for all overhead and other cost. D. Reimbursement for time and materials will be by voucher bases upon the actual staff assigned at rates provided and actual cost incurred based upon documentation acceptable to the Department of Public Safety, subject to maximum amount indicated. 7. Resumes with detailed qualifications and level of competence of individuals to be assigned to the project. This should include the total number of such individuals at each level and estimated hours to be spent by each. Each proposal will be independently evaluated on factors A through E by two or more qualified individuals. A composite score will be computed based on those independent evaluations. CONFIDENTIALITY: The successful response will become part of the contract file and will become a matter of public record, as will all other responses received. If the response includes material that is considered by the bidder to be proprietary and confidential under 1 VSA, Chapter 5, the bidder shall clearly designate the material as such, explaining why such material should be considered confidential. The bidder must identify each page or section of the response that it believes is proprietary and confidential with sufficient grounds to justify each exemption from release, including the prospective harm to the competitive position of the bidder if the identified material were to be released. Under no circumstances can the entire response or price information be marked confidential. Responses so marked may not be considered. CONTRACT TERMS: The selected vendors will sign a contract with the State to provide the items named in their responses, at the prices listed. Minimum support levels, terms, and conditions from this RFP, and the vendor’s response will become part of the contract. This contract will be subject to review throughout its term. The State will consider cancellation upon discovery that a vendor is in violation of any portion of the agreement, including an inability by the vendor to provide the products, support, and/or service offered in their response. 3.10. PERFORMANCE MEASURES In keeping with the intent of the 2010 State of Vermont (SOV) Challenges for Change initiative, all contracts developed with the SOV must contain performance measurements that ensure the best value is received by the State for the funds expended. These may include measures such as meeting or exceeding specific timelines, meeting or exceeding specific measureable performance goals, etc. These measures may also include rewards or sanctions, specifically, the possibility of bonuses paid for superior performance, and decreases in the amount paid for inferior performance. STATE OF VERMONT Department of Public Safety RFP – DPS1161 PAGE 6 Please address in your proposal what types of performance measurements you would suggest be included in your potential contract that would allow the SOV to assess your performance under the contract and ensure that the best value is attained for the SOV. These performance measures will be determined during the contract negotiation process. 3.11. DEFAULT: In case of default of the contractor, the State may procure the materials or supplies from other sources and hold the contractor responsible for any excess cost occasioned thereby, provided, that if public necessity requires the use of materials or supplies not conforming to the specifications they may be accepted and payment therefore shall be made at a proper reduction in price. 3.12. STATEMENT OF RIGHTS: The State of Vermont reserves the right to obtain clarification or additional information necessary to properly evaluate a proposal. Vendors may be asked to give a verbal presentation of their proposal after submission. Failure of vendor to respond to a request for additional information or clarification could result in rejection of that vendor's proposal. To secure a project that is deemed to be in the best interest of the State, the State reserves the right to accept or reject any and all bids, in whole or in part, with or without cause, and to waive technicalities in submissions. The State also reserves the right to make purchases outside of the awarded contracts where it is deemed in the best interest of the State. 3.13. TAXES: Most state purchases are not subject to federal or state sales or excise taxes and must be invoiced tax free. An exemption certificate will be furnished upon request covering taxable items. The contractor agrees to pay all Vermont taxes which may be due as a result of this order. If taxes are to be applied to the purchase it will be so noted in the response. 3.14. ORDER OF PRECEDENCE: The order of precedence for documentation will be the State of Vermont Standard Contract Form and attachments, the bid document and any amendments, and the vendor’s response and any amendments. 3.15. SPECIFICATION CHANGE: Any changes or variations in the specifications must be received in writing from the Department of Public Safety. Verbal instructions or written instructions from any other source are not to be considered. 3.16. AMENDMENTS: No changes, modifications, or amendments in the terms and conditions of this contract shall be effective unless reduced to writing, numbered, and signed by the duly authorized representative of the State and Contractor. 3.17. NON COLLUSION: The State of Vermont is conscious of and concerned about collusion. It should therefore be understood by all that in signing bid and contract documents they agree that the prices quoted have been arrived at without collusion and that no prior information concerning these prices has been received from or given to a competitive company. If there is sufficient evidence to warrant investigation of the bid/contract process by the Office of the Attorney General, all bidders should understand that this paragraph might be used as a basis for litigation. 4. VENDOR RESPONSE CONTENT AND FORMAT: The content and format requirements listed below are the minimum required for our evaluation. They are not intended to limit the content of the proposals; vendors may include additional information or offer alternative solutions which may be considered. 4.1. NUMBER OF COPIES: Submit three original bids. 4.2. BACKGROUND AND EXPERIENCE. Provide a full description of the experience you have had in supplying services of a similar scope. 4.3. REFERENCES. Provide the names, addresses, and phone numbers of at least three companies with whom you have transacted similar business in the last 12 months. You must include contact names who can talk knowledgeably about performance. 4.4. REPORTING REQUIREMENTS: Provide a sample of your current reporting document. 4.5. PRICING: *Define Pricing Requirements. Complete the attached PRICE SCHEDULE. STATE OF VERMONT Department of Public Safety RFP – DPS1161 PAGE 7 4.6. CERTIFICATE OF COMPLIANCE: This form must be completed and submitted as part of the response for the proposal to be considered valid. 4.7. WORKERS’ COMPENSATION; STATE CONTRACTS COMPLIANCE REQUIREMENT; SELF REPORTING: This form must be completed and submitted as part of the response for the proposal to be considered valid. 4.8. WORKERS’ COMPENSATION; STATE CONTRACTS COMPLIANCE REQUIREMENT; SUBCONTRACTOR REPORTING: This form must be completed and submitted as part of the response for the proposal to be considered valid. 4.9. OFFSHORE OUTSOURCING QUESTIONNAIRE: This form must be completed and submitted as part of the response for the proposal to be considered valid. 5. SUBMISSION INSTRUCTIONS: 5.1. 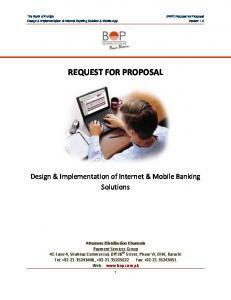 CLOSING DATE: The closing date for the receipt of proposals is July 15th, 2011; 4:00 pm. 5.2. The bid opening will be held at 103 South Main Street, Waterbury, VT 05671-2101 and is open to the public. 5.3. SEALED BID INSTRUCTIONS: All bids must be sealed and must be addressed to the State of Vermont, Department of Public Safety, 103 South Main Street, Waterbury, VT 05671-2101. BID ENVELOPES MUST BE CLEARLY MARKED ‘SEALED BID’ AND SHOW THE BID NUMBER AND/OR PROPOSAL TITLE, OPENING DATE AND NAME OF BIDDER. 5.3.1.All bidders are hereby notified that sealed bids must be received and time stamped by the Department of Public Safety located at 103 South Main Street, Waterbury, VT 05671-2101 by the time of the bid opening. 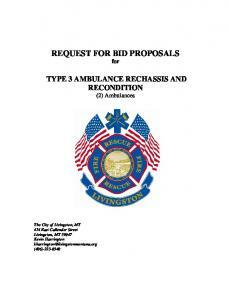 Bids not in possession of the Department of Public Safety at the time of the bid opening will be returned to the vendor, and will not be considered. Department of Public Safety may, for cause, change the date and/or time of bid openings or issue an addendum. If a change is made, the State will make a reasonable effort to inform all bidders by posting at: http://www.vermontbusinessregistry.com/BidSearch.aspx?type=5. All bids will be publically opened. Typically, the Department of Public Safety will open the bid, read the name and address of the bidder, and read the bid amount. However, the Department of Public Safety reserves the right to limit the information disclosed at the bid opening to the name and address of the bidder when, in its sole discretion, the Department of Public Safety determines that the nature, type, or size of the bid is such that the Department of Public Safety cannot immediately (at the opening) determine that the bids are in compliance with the RFP. As such, there will be cases in which the bid amount will not be read at the bid opening. Bid openings are open to members of the public. Bid results are a public record however, the bid results are exempt from disclosure to the public until the award has been made and the contract is executed. State of Vermont ATTACHMENT C: STANDARD STATE PROVISIONS FOR CONTRACTS AND GRANTS 1. Entire Agreement: This Agreement, whether in the form of a Contract, State Funded Grant, or Federally Funded Grant, represents the entire agreement between the parties on the subject matter. All prior agreements, representations, statements, negotiations, and understandings shall have no effect. Applicable Law: This Agreement will be governed by the laws of the State of Vermont. Definitions: For purposes of this Attachment, “Party” shall mean the Contractor, Grantee or Subrecipient, with whom the State of Vermont is executing this Agreement and consistent with the form of the Agreement. Appropriations: If this Agreement extends into more than one fiscal year of the State (July 1 to June 30), and if appropriations are insufficient to support this Agreement, the State may cancel at the end of the fiscal year, or otherwise upon the expiration of existing appropriation authority. In the case that this Agreement is a Grant that is funded in whole or in part by federal funds, and in the event federal funds become unavailable or reduced, the State may suspend or cancel this Grant immediately, and the State shall have no obligation to pay Subrecipient from State revenues. No Employee Benefits For Party: The Party understands that the State will not provide any individual retirement benefits, group life insurance, group health and dental insurance, vacation or sick leave, workers compensation or other benefits or services available to State employees, nor will the state withhold any state or federal taxes except as required under applicable tax laws, which shall be determined in advance of execution of the Agreement. The Party understands that all tax returns required by the Internal Revenue Code and the State of Vermont, including but not limited to income, withholding, sales and use, and rooms and meals, must be filed by the Party, and information as to Agreement income will be provided by the State of Vermont to the Internal Revenue Service and the Vermont Department of Taxes. Independence, Liability: The Party will act in an independent capacity and not as officers or employees of the State. The Party shall defend the State and its officers and employees against all claims or suits arising in whole or in part from any act or omission of the Party or of any agent of the Party. The State shall notify the Party in the event of any such claim or suit, and the Party shall immediately retain counsel and otherwise provide a complete defense against the entire claim or suit. After a final judgment or settlement the Party may request recoupment of specific defense costs and may file suit in Washington Superior Court requesting recoupment. The Party shall be entitled to recoup costs only upon a showing that such costs were entirely unrelated to the defense of any claim arising from an act or omission of the Party. The Party shall indemnify the State and its officers and employees in the event that the State, its officers or employees become legally obligated to pay any damages or losses arising from any act or omission of the Party. Personal Injury Liability Contractual Liability The policy shall be on an occurrence form and limits shall not be less than: $1,000,000 Per Occurrence $1,000,000 General Aggregate $1,000,000 Products/Completed Operations Aggregate $ 50,000 Fire/ Legal/Liability Party shall name the State of Vermont and its officers and employees as additional insureds for liability arising out of this Agreement. Automotive Liability: The Party shall carry automotive liability insurance covering all motor vehicles, including hired and non-owned coverage, used in connection with the Agreement. Limits of coverage shall not be less than: $1,000,000 combined single limit. Party shall name the State of Vermont and its officers and employees as additional insureds for liability arising out of this Agreement. 8. Reliance by the State on Representations: All payments by the State under this Agreement will be made in reliance upon the accuracy of all prior representations by the Party, including but not limited to bills, invoices, progress reports and other proofs of work. a. Party understands and acknowledges responsibility, if applicable, for compliance with State tax laws, including income tax withholding for employees performing services within the State, payment of use tax on property used within the State, corporate and/or personal income tax on income earned within the State. b. Party certifies under the pains and penalties of perjury that, as of the date the Agreement is signed, the Party is in good standing with respect to, or in full compliance with, a plan to pay any and all taxes due the State of Vermont. c.
Party understands that final payment under this Agreement may be withheld if the Commissioner of Taxes determines that the Party is not in good standing with respect to or in full compliance with a plan to pay any and all taxes due to the State of Vermont. CERTIFICATE OF COMPLIANCE This form must be completed in its entirety and submitted as part of the response for the proposal to be considered valid. TERMS OF SALE: The undersigned agrees to furnish the products or services listed at the prices quoted. The Terms of Sales are Net 30 days from receipt of service or invoice, whichever is later. Percentage discounts may be offered for prompt payments of invoices, however such discounts must be in effect for a period of 30 days or more in order to be considered in making awards. All returned quotes and related documents must be identified with our request for quote number. RFP/PROJECT: DATE: WORKERS’ COMPENSATION; STATE CONTRACTS COMPLIANCE REQUIREMENT Self Reporting Form 1 of 2 This form must be completed in its entirety and submitted as part of the response for the proposal to be considered valid. The Department of Public Safety in accordance with Act 54, Section 32 of the Acts of 2009 and for total projects costs exceeding $250,000.00, requires bidders comply with the following provisions and requirements. Bidder is required to self report the following information relating to past violations, convictions, suspensions, and any other information related to past performance relative to coding and classification for worker’s compensation. The state is requiring information on any violations that occurred in the previous 12 months. *Form must be signed by individual authorized to sign on the bidder’s behalf. If any or all of the services are or will be outsourced offshore, Vendors are required to provide a cost estimate of what the cost would be to provide the same services onshore and/or in Vermont. Report "SEALED BID REQUEST FOR PROPOSAL"